My response to most of Mr. Spielberg’s films has been that of mild indifference. He has not been a filmmaker I have ever thought ill of, and even in his most offensive efforts (The Color Purple, Indiana Jones and the Kingdom of the Crystal Skull), I wasn’t particularly nitpicking about the craft on display. But his best work (Jaws, Catch Me If You Can, and Minority Report) has never aroused me to commend the craft on display either. He exists as a director of whom I am surprisingly familiar with, but at the same time, resist. I don’t harbor the same resentment that some have over the man, such as Jean-Luc Godard’s criticism that Mr. Spielberg is responsible for “the lack of artistic merit in mainstream cinema” – meanwhile, I understand the attacks made against him. Effectively, my stance on Spielberg, the filmmaker, is the same as my stance on his films – mild indifference. 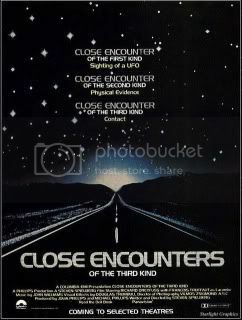 So it should be of no surprise that I wasn’t particularly moved by Close Encounters of the Third Kind, a film that I admittedly, had high hopes for. Leafing through the Spielberg cannon, I felt that Close Encounters was my most glaring of omissions and sought to remedy the situation. I found the film’s opening act, where alien life is brought to the world, to be rather effective – you gather that aliens are not merely touching upon the United States, but all across the world. 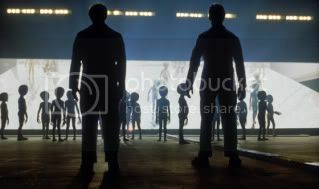 Obviously, Spielberg zeros in on how the potential of alien life affects select individuals, but that initial introduction has a global aspect to it that I wished Spielberg would pursue. The sense that none of the characters know what is going on is riveting as well, as the world that Spielberg initially frames is one that is grounded in a sense of reality. Unfortunately, once that initial encounter happens, I grew increasingly distant from the film and its characters. The problems stem from what I look for and appreciate in cinema, and what Mr. Spielberg provides. He isn’t a bad filmmaker by any stretch of the imagination – he is, for all intensive purposes, an imaginative person who manages to convincingly realize his visions. But there’s an emotional component that he adds to his films that I always feel comes across as forced. The emotional component feels less like something organic, and more like padding to progress the narrative. In Close Encounters of the Third Kind, it’s Richard Dreyfuss who accepts the position of taking the audience from point A to point B, and in doing so, he attempts to provide a completely dimensional character. But the writing is so uneven, that his portrayal results in a totally unconvincing character that removes you from the film entirely. Upon the film’s conclusion, in a scene of such lush visual design and imagination, we’re left with a disappointing image of seeing Dreyfuss conclude his narrative arch and obsession – yet the other dimensions to the story, such as what happens to his family and his role as a father, is conspicuously absent. This exemplifies the tragic flaw in pretty much all of Spielberg’s films – the need to sweep emotional details under the rug in exchange for a visually appealing, happy ending. Boiling down Stroszek to its most fundamental elements leaves a synopsis that could read: “Two men and a woman leave Germany for Wisconsin”. But then when accounting for Herzog’s narrative sensibilities, the synopsis can be revised as “a mentally challenged ex-con, an elderly man, and a prostitute leave Germany for Wisconsin”. For better or worse (in this case, it’s for the better), Herzog’s bizarre sensibilities serve to enhance what could have been a fairly typical narrative layout. But what took me most off guard was the sense of genuine human pathos involved with such bizarre characters. From the onset of the film, the title character (played by Bruno S.) is sent home from jail. The warden offers a bit of advice – to keep his fly up and to stop drinking. Stroszek then immediately goes to a bar, wherein he meets with what seems to be an old friend named Eva (Eva Mattes). Eva, a prostitute, is violently assaulted by her pimps on numerous occasions. This violent response prompts Stroszek to house Eva in an apartment that is being held by his elder friend named Scheitz (Clemens Scheitz). 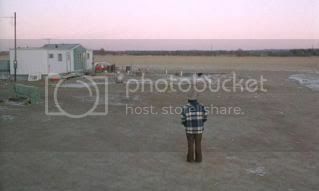 As the violence against Eva expands to include Stroszek and Schietz, the three decide to leave Germany for Wisconsin. Their reasoning and logic behind choosing Wisconsin is faulty (like so much of their logic), but they go with it. What follows is a bewildering situation that leads Eva, Scheitz, and Stroszek to follow their separate paths. Eva, who initially takes work as a waitress, finds her life with Stroszek to be too confining, and instead opts to return to her sexually deviant behavior. Scheitz conducts research on animal magnetism. Stroszek is perhaps the most aware of the situation around him, yet the language barrier prevents him from ever understanding the real gravity of his social position. Stroszek comments on the differences in hostility between America and Germany – in Germany, the violence that was against him was overt. Eva’s pimps assaulted him on a purely physical level. In America though, violence is something against the spirit, wherein Stroszek is slowly killed with kindness and passive aggressiveness. As the film reaches its increasingly bizarre conclusion (one that includes a dancing chicken), the hopelessness associated with Stroszek’s life almost becomes unbearable. So much of the film is difficult to watch, both in the awkwardness it provokes and the muddled truth it promotes. This is only further compounded by Bruno S.’s convincing performance and the unsightly terrain that Herzog shoots – this is one of the ugliest film’s I’ve seen, but appropriate given its meaning to the whole of the film.